This report includes a situation update submitted to KHRG in February 2013 by a community member describing events occurring in T'Nay Hsah Township, Hpa-an District between June 2012 and February 2013. The report describes monks demanding money and labour from villagers for the building of roads and pagodas. Also detailed in this report is the loss of money and possessions by many villagers through playing the two-digit lottery. Further, the report describes the cutting down of forest in Yaw Ku and in Kru Per village tracts by the DKBA and the BGF, including 30 t'la aw trees, which villagers rely upon for their housing; the Tatmadaw have also designated land for sale without consulting local villagers. This report also describes the prevalence of amphetamine use and sale in the area, involving both young people and armed groups including the BGF, KPF and DKBA. 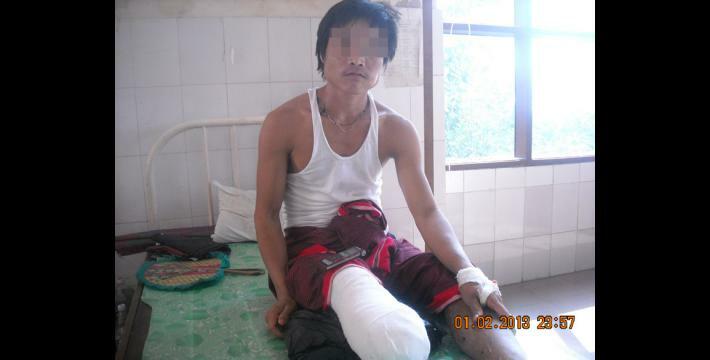 Finally, the report details the ongoing danger posed by landmines, which continue to stop villagers from going about their livelihoods and are reportedly still being planted by armed groups. The following situation update was written by a community member in Hpa-an District who has been trained by KHRG to monitor human rights conditions. It is presented below translated exactly as originally written, save for minor edits for clarity and security. This report was received along with other information from Hpa-an District, including nine interviews and 48 photographs. I want to report what I have seen and know in the area. I want to write about [issues connected with] the Buddhist religious group that has caused negative impacts to villagers. Villagers have to build roads under the orders of [Buddhist] monks; build pagodas under monks' orders and [monks request] that villagers give donations, which is like taxation. [When] monks have built roads or monasteries, they have asked for money [from villagers] and said that it was all donations. When I was travelling I saw a lot of pagodas. There are also many roads and monasteries. I also saw a lot of cars in the monastery gardens. I asked one villager, "If you don't help, if you don't give money, what will happen?" [He/she answered], "If we don't go, if we don't give [the] money that they asked [for], the money collectors told us that if you die, you will call monks. As a result, we have to do [it]. We cannot avoid doing [the labour] as well as providing donations. 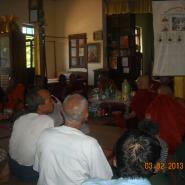 "So, the Buddhist religious [monks] abuse human rights. I saw [that] they asked for money in many places along the road. In the area, people do not know what abuses their rights. There are 17 village tracts in T'Nay Hsah Township, which are located beside the mountain in a flat area. The villagers play the two-digit lottery and gamble. The two-digit lottery opens twice a day. Many of the villagers play this. When I went to the area, I saw and heard that many people lost the two-digit lottery. Saw Y--- from T--- village lost 4,000,000 kyat (US $4,398);Saw Y---'s wife, Naw L---, lost 400,000 kyat (US $440). Naw C--- and Naw N--- lost 500,000 kyat (US $550) on the two-digit lottery; Naw O--- lost 32.658 grams of gold [in the form of jewellery] and 1,200,000 kyat (US $1,319) on the two-digit lottery. Naw M--- lost the two-digit lottery and she had to sell her orchard and one flat field. The selling price of one orchard [Naw M---'s orchard] was 630,000 kyat (US $692); one flat field can be sold for 5,000,000 kyat (US $5,497). Even though she sold all this, she is still in debt. Naw P--- lost the two-digit lottery and she sold one flat field farm for 5,000,000 kyat (US $5,497), but she is still in debt. Naw H--- from T--- [village] lost 8,000,000 kyat (US $8,796) on the two-digit lottery. Naw S--- from T--- lost the two-digit lottery and she had to sell her one rubber plantation for 5,000,000 kyat (US $5,497). Saw W--- from K--- village lost 20,000,000 kyat (US $21,990) on the two-digit lottery. Naw Hs--- from K--- village lost the two-digit lottery and she [had to] sell one flat field farm, one orchard and all her cows and buffalo, but she is still in debt. Saw Z--- from K--- village lost the two-digit lottery and he had to sell one of his plantation orchards. Naw Sh--- from W--- village lost the two-digit lottery and she had to sell one of her rubber plantations, her house and one flat field farm for 8,000,000 kyat (US $8,796) and 800,000 kyat (US $880) [8,800,000 kyat]. After she sold all of her property, her family went to stay in Ben Klaw [Mae La Refugee Camp]. Saw Ka--- from Hp--- village lost the two-digit lottery. He had to sell one orchard, one house, one tractor and one motorbike for 46,000,000 kyat (US $50,577). After he sold all his property, he went to Bangkok and got a new wife. His old wife has children: Saw R---, 20 years old; Naw U---, 18 years old; Saw Th---, 16 years old; and Naw Ch---, 12 years old. I look for people who have lost [the two-digit lottery] and it is sorrowful, it causes children sadness, especially children who attend school. If we look on the other hand, the government does not provide a work place for them. There are a lot of people who have lost [the two-digit lottery] and I cannot write down all [of them] from the whole Township. 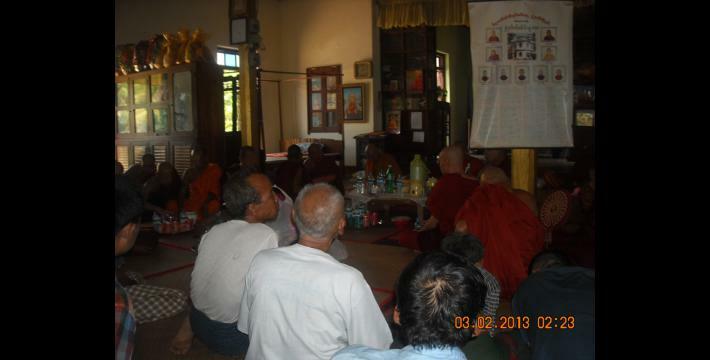 On January 15th 2013, one village head from Kru Per village tract came and met with me in W--- village. He told me that now, people cut down t'la aw trees that we [villagers] collect leaves from, find firewood and forage [around]. People who cut down the trees include U Pyu Oh from Kru Tu, BGF [Border Guard Force] Battalion commander. 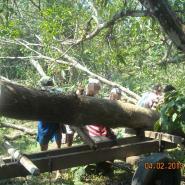 He cooperates with a company and they cut down trees in Kaw Waw Loh Pwa [Forest]. The place is in Kru Per village tract. The [area of] forest that has already been cut down is 150 acres. BGF Battalion Commander U Phu Oh and Company plan to cut down 2,000 acres of the forest. The villagers want others to help to protect the forest. 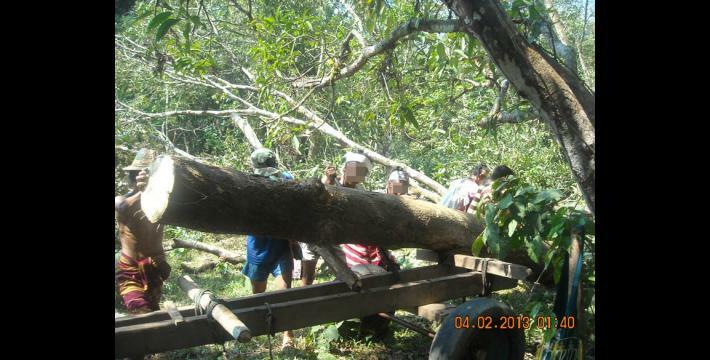 On February 9th 2013, DKBA [Democratic Karen Benevolent Army] Company Commander Saw K'Baw Yoo came back and cut down t'la aw trees in E--- village, Yaw Ku village tract, T'Nay Hsah Township, Hpa-an District. They cut down 30 t'la aw trees where villagers come to collect leaves. No one dared to talk to them. If people went to tell them [to stop cutting down the trees], they [would] fire guns and act aggressively. The crazy medicine [yaba] is produced in Noh Hta Baw hill, Noh Hta Baw village tract and also in Kyeh Paw K'Lah Koh, Kyeh Paw village tract. Kyeh Paw and Noh Hta Baw village tract are in T'Nay Hsah Township, Hpa-an District. People who produce the crazy medicine include [BGF] Battalion #1016 Battalion Commander Mya Khaing. The drugs are everywhere. People sell the drugs on Kaw T'Ray vehicle road to Aw Po Deh in every shop and as well as in A---, We--- and Re---. These are the exact places that I know. People who sell this [drug] are people in charge; they hold guns and [are] leaders. There are also people who secretly sell the drugs in villages. There are many young people who use the drug and it is destructive. 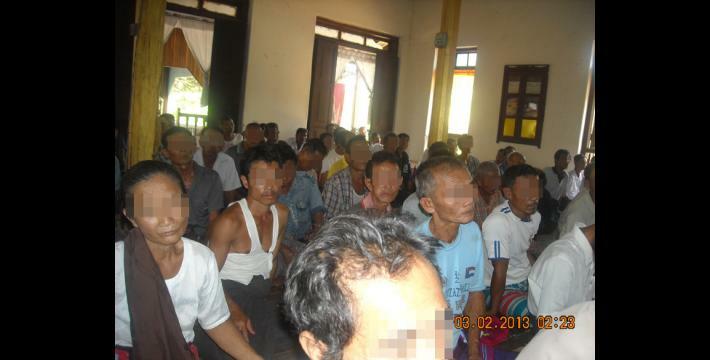 The villagers dare not talk about banning the drug and they also do not dare to tell Kyaw Thu, Kyaw Wah. The drugs are sold the most when people celebrate Ar Wer Day, amongst people gambling. At the place where the drugs are produced, there are five rounds of BGF soldiers guarding it, so people can not see and find out. The drugs are used mostly by KPF, BGF and DKBA soldiers. Mostly their wives and relatives are sending this [to them]. If people say [accuse] the soldiers of using and selling drugs, they fire guns and act aggressively towards the villagers. This shows that if people protest the drugs, they [the soldiers] will fight. On February 11th 2013, at 11:00 pm, DKBA Officer Maw Bee Aye, was high on drugs so he came back and fired a gun in the Ya--- village. The villagers were afraid but they dared not say anything. I saw an example on February 16th 2013, when Saw Ne--- used the crazy medicine and he became crazy. Saw Ne--- lives in Hp--- village, Noh Kay village tract, T'Nay Hsah Township, Hpa-an District. He got crazy off the crazy medicine so he came back to the village and destroyed people houses, killed pigs and cats, took someone's musket and fired it and destroyed people's videos and TVs; the whole village was afraid of him. If we look back we can say that half of the young people from the village use drugs. Some go to school and buy drugs. [The] parents [in one family] had to sell their flat farm to redeem their orchard and their motorbike, which were pawned by their children due to the use of crazy medicine. The village head and elders can do nothing about this case because it [yaba] is produced nearby and is sold in many places. The villagers want people to ban this. When I went, I saw and heard that villagers are tired of dealing with the issue. 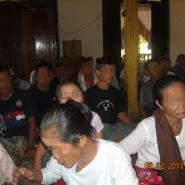 In Township #3 [T'Nay Hsah], there are 17 village tracts and there are a lot of young people. I want to report about the government military marking a place for planting rubbers plantations in the area. On June 2012, LIB [Tatmadaw Light Infantry Brigade] #547 and some rich people came and marked places from the vehicle road to Koh Poh Ya, including villagers' flat farm fields and orchards. People [some of the villagers, who are involved with business] cooperated with LIB #547 and the rich people from a company to plant rubber trees. 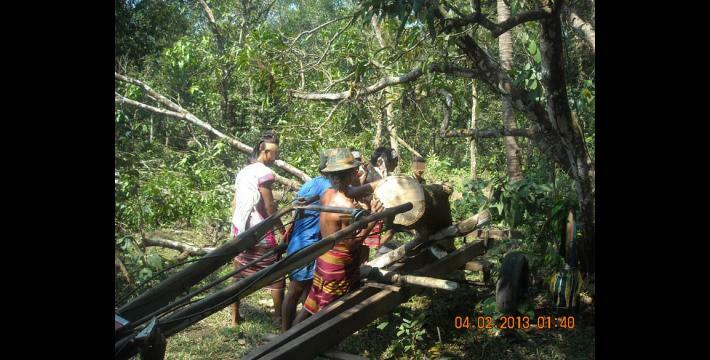 After they [villagers] plant [rubber], they sell it to the company and get a small profit. If we look back at the work of LIB #547, it hurt the villagers. After they [LIB #547] marked places, they sold one acre for 500,000 kyat (US $550). Recently, the villagers reported this information to a democracy group [National League for Democracy (NLD)] at their office [in Kawkareik] and since then, they [villagers] have not seen people clear lands for planting rubber plantations. Another one [problem] is that the government military [Tatmadaw] from Kaw T'Ree came with soldiers to Yaw Ku on December 15th 2012 and they marked ground in Yaw Ku village tract. It started from the top of Naw Ma--- village and [they marked to] to Me--- village. They came and marked this but they did not tell any villagers or village heads. People knew only that they came and marked land. No villagers know what they are going to do with the land that they have marked. Some villagers heard that the Burmese [Tatmadaw] will sell one acre for 50,000 kyat (US $55) but it is not sure yet. Operation Commander Hpaw Doh [Karen National Liberation Army (KNLA) Brigade #7] told villagers that if Burmese come and mark land, villagers must not tell anyone, it is their fate. Nowadays in the area, the government military set up administrators in every village. 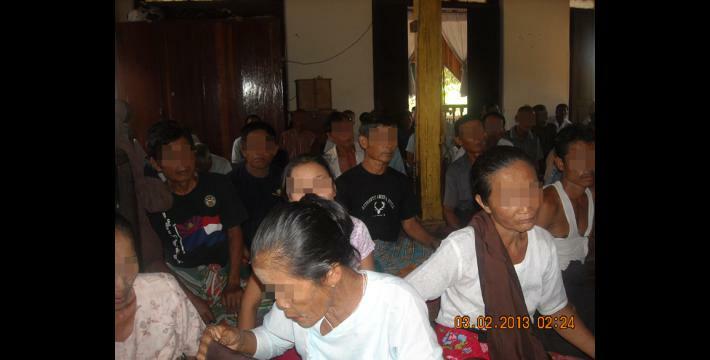 In the past, they [the Tatmadaw] installed Kya Hkeh Yay group [a branch of the Tatmadaw] and now they have installed ten household leaders [villagers chosen by the Tatmadaw to run the village]. In the past, they [Tatmadaw] also chose the village head. So now, the villagers do not know exactly who is in control. 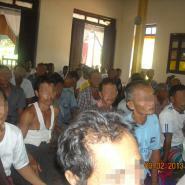 As a result, there are many armed groups and the villagers do not know which armed group they have to listen to. They do not know if it is a DKBA area, BGF area, KPF area or KNLA and KNU [Karen National Union] area. The villagers stay inside frightened. The Government has to take responsibility for solving the problems. Now, there is one more group called democracy [NLD]. One village head reported about why the villagers have been afraid; in the past, there were many bad things happening regarding [villagers accusing the Tatmadaw of being] traitors and killing, so until now there is still no trust [for the Tatmadaw] in the villagers' hearts. There are no soldiers who can understand politics and the villagers also do not know what their rights are. 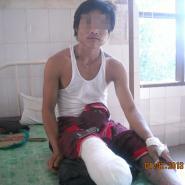 I want to report about landmines in 2012 and the consequences that affect the villagers. 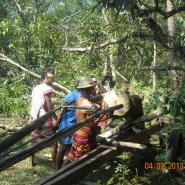 The consequences are that the villagers do not dare to go out to cut wood and bamboo poles to repair their houses. Instead, the villagers have to cut down their mango trees, jack fruit trees, santol trees, marian plum trees and trees that they have planted in their garden to shadow their houses. They have to cut those trees down to repair their houses. Landmines are in the forest that villagers go to in order to cut wood. One villager reported that if people still plant landmines in the coming three years, there will be no more big trees in the village. People who plant landmines are the KNLA and DKBA. In 2012, BGF soldiers also planted landmines. The armed groups are still planting new landmines. Saw D--- stepped on a landmine on January 20th 2013 in Th--- [village]. The landmine was new and it was a DKBA landmine. In order to increase the transparency of KHRG methodology and more directly communicate the experiences and perspectives of villagers in eastern Burma, KHRG aims to make all field information received available on the KHRG website once it has been processed and translated, subject only to security considerations. As companion to this, a redesigned website will be released in 2013. In the meantime, KHRG's most recently-published field information from Hpa-an District can be found in the report, "Hpa-an Situation Update: Ta Kreh and T'Nay Hsah Townships, December 2012," KHRG, April 2013. Saying that monks will need to be called if the money is not paid is the equivalent of a threat to the villagers' lives; this is clear in the original Karen language document. Sarpyanpwe Festival is held in May or June; the month of Nayon in the Myanmar calendar. The festival marks the beginning of the rainy season and also the time of examinations for Buddhist monks, when they are tested on their knowledge of the Buddhist scriptures. As of May 15th 2013, all conversion estimates for the Kyat in this report are based on the official market rate of 909 kyat to the US $1. This reflects new measures taken by Burma's central bank on April 2nd 2012 to initiate a managed float of the Kyat, thus replacing the previous fixed rate of 6.5 kyat to US $1. The leaves of t'la aw trees are traditionally collected by villagers and used for the roofs of houses. Democratic Karen Benevolent Army; originally called the Democratic Karen Buddhist Army, is a 1995 breakaway group from the KNU/KNLA which signed a ceasefire agreement with the SPDC government and directly cooperated at times with Tatmadaw forces, now referring to a splinter group from those DKBA forces reformed as Tatmadaw Border Guard forces, but independent of KNLA. Ar Wer Day is the name of an event that was founded by Commander Mya Hkaing, formerly of the DKBA and currently Border Guard Battalion #1015 Commander. Ar Wer Day events typically consist of a group of people gambling and usingyaba. Karen Peace Force, which was formed in February 1997 after splitting from the KNU/KNLA, by surrendering to and signing a ceasefire with the Burmese military government. The KPF controls some administrative areas in Three Pagodas Pass and operates a number of road and river checkpoints in the area of Three Pagodas Pass. Following repeated rejections of Burmese government proposals to reform KPF into the Tatmadaw Border Guard, substantial elements have since reformed in the Tatmadaw Border Guard in 2010 while others remain independent. See Mizzima Election 2010 Factsheet: KPF.